With the Tsunami & Libya dominating the news the recent fiscal irresponsibility of three quarters of the freshman Republicans & most veterans (as usual) of both the House & Senate has escaped significant mention - except most notably on this blog, the Mark Levin Radio Program in concert with AFP, & Judge Napolitano's Freedom Watch TV show on FBN. 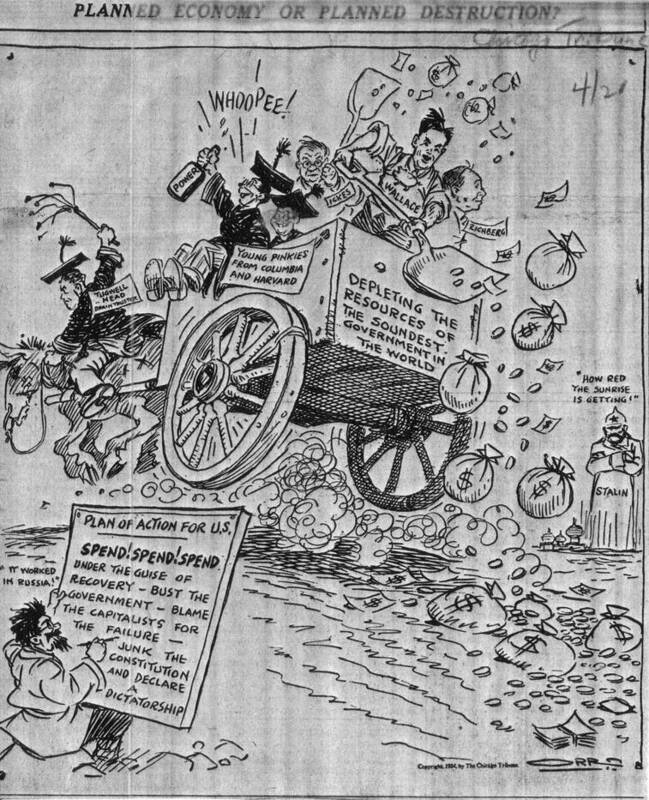 The subject has continued to interest readers here as evidenced by the above cartoon from a 1934 Chicago paper that was sent to us by a subscriber of ReturnToExcellence. net. Below are two more comments that I believe add to the discussion - they are responding to the two comments from Saturday's posting. With regard to the Tsunami, Libya, & the fiscal irresponsibility of the aforementioned elected Representatives decide for yourself which one will have the most long lasting devastating effect. Doug - I won't say that we are a socialist country, quite yet, but both of these responses indicate that we are well on our way. 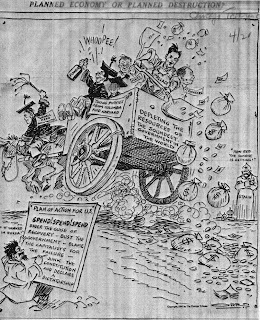 Response #1 obviously illustrates our dependence on the federal dole out, and #2 while correct about taxes, speaks more to re-distribution of wealth to the point where everyone is equally poor. Please make no mistake about it, if these freshmen are afraid to do what is necessary, then they will lose the next election and not because they cut too much. We the People need to support these freshmen and make our desire well known so as not to leave any questions in their minds. I'm not totally giving up on the freshmen members. I believe Responder #2 is correct in his assessment of the freshmen members. They've only been there since the new Congress convened in Jan. and are still learning the ropes. They should be given some time, however, they also need to be reminded by all of us, especially the people who voted them in of why they were elected. They need to know that if they don't follow through on their promises, they will not be returning to Congress next election cycle.